Carrara have great tools for lanscape creation. enjoy , hope you like this. That's a beautiful shot! It would be perfect if the tree's to the left had some underbrush or tree litter or something. :D I think that's the only thing preventing this from looking like a photo. Carrara have great tools for landscape creation. Very beautiful scene, solt, and nice render job. I love it. Would it be okay for others to post Carrara landscape renders, work in progress screenshots, and /or other related posts in this thread? It has a great title and introduction image to launch such a thread, in my opinion - and the very true fact that you say in that first post, inspires me to hop on into Carrara and jam on a landscape! And I really like Dart's idea to have a themed thread for landscapes, even if it doesn't turn out to be this one. Seems like a good idea to have a place where those whose focus is on creating and rendering landscapes can post their work, exchange ideas and feedback and give tips to each other. I aggree as well I would like to learn more about the landscaping features that Carrara has. It is a wonder how much can be done with the terrain primitives in the terrain editor. From all of the generators and filters that you can add and switch where they take place in the lineup of how they affect the mesh, to the built-in height map editor, to the ability to export your height map, import your own, perhaps after editing one you've exported - and then mix in more generators and filters on top of that. Then comes the power of those terrain shaders! Yikes it's very impressive and fun to play with! Carrara is an amazing tool it has so much to offer. it's a 3D swiss army knife. I feel like a kid in a candy store. I am wanting to play with the terrain editor but am in the middle of working with so many other parts of it. I just can't learn it fast enough! It will download a PDF file. This tutorial will teach you how to create stunning landscapes in Carrara 4. As this is an early introduction, you will experience the very basic principals for quickly building realistic landscapes, concentrating on shading and lighting. The terrain generating feature in Carrara 4 is very intuitive. Once you have completed this tutorial, you will be able to render stunning landscapes by using the standard generated terrains from Carrara 4. Tutorial created by: Johannes Rosenberg (Cajomi) A master at lanscape creation. hello, and thank you all. sorry I do not not see all of these answers about this subject. yes, Dartanbeck, it is a good idea that you submit. One thing that I really enjoy doing, when creating Carrara terrain, is to use the generators and filters to help me to get the overall shape and texture of the environment. When I say texture in this way, I'm referring to the bumpiness and mesh resolution. Be careful setting your resolution too high in the view port, or you could come to a halt with certain filters, like rain erosion. Once I get the terrain to the proper look and feel, worrying less about the central content use area, and more on how I want the surrounding terrain to be, I use the Export Map function and tweak a mid-gray smooth center in the middle with an image editor. Depending upon the image editor used, you can also ad further details and changes by simply changing contrast and/or brightness and by painting directly onto the map. Then bring the new map in and make a terrain using it, which now saves from having to calculate the affect of all of those generators and filters I've used to make the initial shape. So now that I've imported my new height map, I set the intensity to get the height scaling the way I have envisioned it to be and then start having fun with more generators and filters, etc., to get it just the way I want it to be. Keep in mind, while making terrain for use with content, that the resolution used on the view from within the terrain modeler should be equal to the render output, so that you'll have a better idea of where the terrain will be during the render. For example, the default terrain uses a much lower resolution for the working view than the render. So if you set the feet of a character firmly on the ground, the render might put the feet deeper under the surface, or float them over the top. Thanks for the link, the Rosenberg site has some very impressive renders. One of the very best things about Carrara is the Terrain primitive and shader. It makes it so easy to get started. 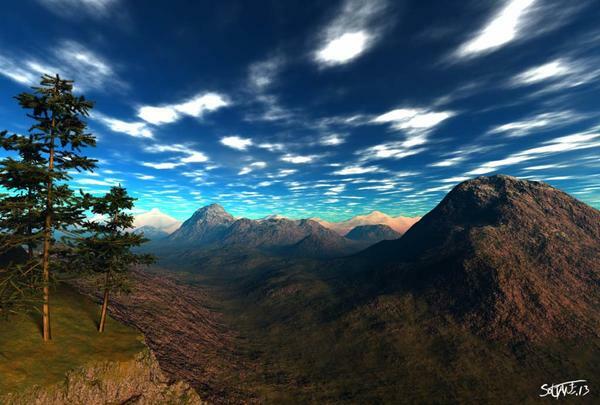 Combine with some good tutorials and you can build incredible landscapes. I have not yet come close to creating any landscape in LightWave like those that I have done in Carrara! I would have to say I am impressed with the landscapes I have seen. I didn't even realize when I first aquired Carrara that it had such a powerful landscape generator. Once I get the terrain to the proper look and feel, worrying less about the central content use area, and more on how I want the surrounding terrain to be, I use the Export Map function and tweak a mid-gray smooth center in the middle with an image editor. My current preference is to start with Daylon Graphics Leveller; export that as a PNG (though they support a "Carrara MSH file...never heard of that and haven't tried it). I often tweak the PNG in Photoshop and then use it in Carrara. I am wondering about World Machine and what it can produce. Curious to find if it is worth moving to from Leveller. I use Leveller as well. And since they dropped the price, its an even better value. 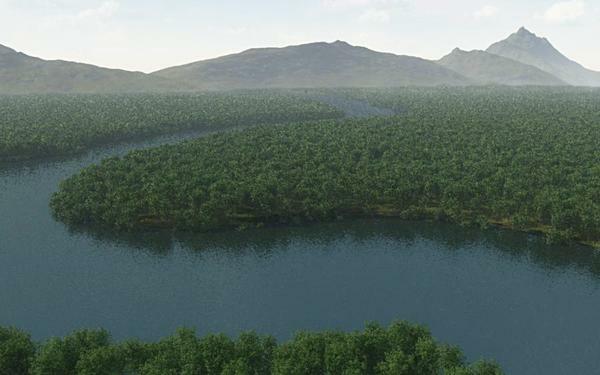 WorldMachine, GeoControl and Terragen are all worth looking into. I think Terragen is positioning itself as a "Pro" app in its latest v3 pricing, although they were still selling licenses for v2 when I checked a few months ago. I think Terragen is positioning itself as a "Pro" app in its latest v3 pricing, although they were still selling licenses for v2 when I checked a few months ago. I seriously considered Terragen before I found Carrara. I'll have to see what they added to it. While the terrain editor is very powerful, what really makes landscapes in Carrara (IMHO) are the use of replicators. Use them for trees, grass, rocks, etc. It is Carrara's equivalent to Vue's ecosystems, and you don't see many Vue images that don't include ecosystems, and yet Carrara's replicators seem very underused to me. I have included a quick sketch I did recently of a rain forest river as a quick and dirty example. Oh my.. that is a beautiful shot! And yes, Replicators are the way to go in Carrara. the only problem with them is that they are single threaded... so they don't take advantage of multithreading on modern machines to speed up placing the plants during render. Does anyone know if Inagoni's Replica plugin has the same limitation? I was under the impression that any operation that modifies, instances, deforms, morphs etc must be "baked" into actual geometry when rendered ... ? Perhaps that's the way it is in the VM, but in the case of surface replicators, the objects being replicated are different meshes. Absolutely not! The main benefit of using replicators is that you can produce renders with thousands of instances of an object, while only needing one actual model in memory, so it is very efficient. They tend to render quite fast too, but with a bit of a delay if lots of large replicators are used, as Boojum has said. It is generally not too much of a hardship for the results. There are a number of Carrara landscapes on this page of my website, many used GeoControl to aid in the terrain work. Impressive stuff - I particularly liked image 16 for ImagineFX magazine, a real Vue-beater! Very impressive stuff. I love the render "A study of glass and lighting textures", amongst the rest. Very nice stuff! someone that is knowledgeable and talented. Thanks for sharing these. RingoMonfort - Thanks for the PDF - this is an area I know little about so far and a guide really helps. Cool shader tutorial! That's pretty much the same approach I take towards making terrain, except that I take off everywhere where he says that you can, if you like. I am most enthused about how much power there is in the creation of landscaped in Carrara. And the way that we can apply shaders to them is a big part of that amazement! Johannes shows us how different things look in Carrara 4, yet still provides an excellent overview of the process, as that remains the same, with more availabilities and somewhat different looking shader interface. I was expecting more of a tut on manipulating filters and generators, using height maps, or any of the other shaping features that we have at our disposal. Instead, he glances over that in the first page or two, and digs into setting up the shaders, and then choosing the perfect view from what you have, and then working the lighting to make for a great render. What an excellent tutorial for getting started in the fantastic fundamentals of working with terrains in Carrara. Thanks to Johannes, for writing the report. And thanks to Ringo for knowing where the thing is - and making it available to us. It would be fun to go back and purchase up some of these older copies of Carrara. At first, I was thinking of how cool those boxes would look on my shelf - being that Carrara is my top #1 favorite software I've ever used. But now, looking at this... it would just be a blast to go through the help files, included freebies and tutorials, etc., as well as to install them and have a play with the changes in the interface. What fun that could be! Love your work Patrick. wonderful carrara landscapes !! !.